Peppermint oil has been used in healing remedies since 1500 BC. It has been used in Greek and Roman mythology and used throughout cultures throughout the world. Most people know that you should drink peppermint tea when your stomach doesn’t feel well. And I think most of us know that many topical analgesics like Tiger Balm smell of peppermint, not to mention the respiratory benefits from Vick’s Vapor rub and the like. It doesn’t take a scientist to tell you that peppermint is great for your respiratory system–you just have to pay a visit to the Celestial Seasonings factory in Boulder and spend a minute in the famous peppermint room! WebMD has a whole list of ailments peppermint oil can help. It also lists some of the side effects, including burning on the skin. 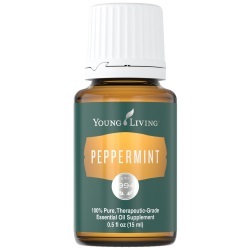 Peppermint oil is quite powerful, so be sure to use it with a carrier oil (jojoba oil, avocado oil, etc.) when applying to your skin, and make sure you don’t get it too close to your eyes. You can also use it as a dietary supplement, but make sure it won’t interfere with any current medications you are taking. We have a recipe on our Pinterest where you can use peppermint oil for a yummy, chocolatey, healthy treat!